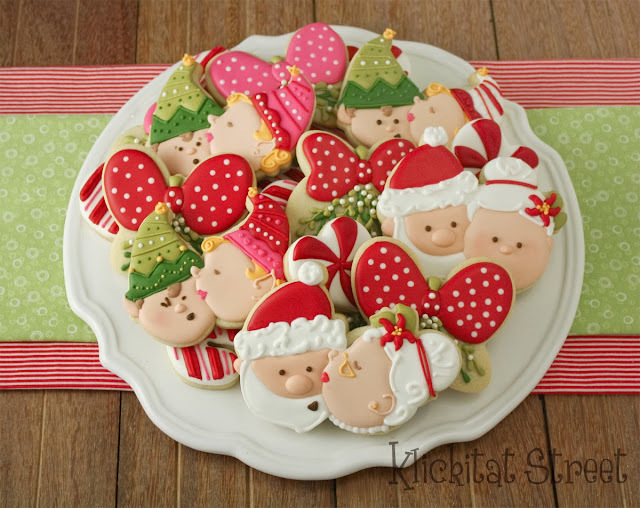 Yesterday, the fabulously sweet Callye of Sweet Sugarbelle had me as a guest on her blog to do a tutorial for mistletoe cookies. When she asked me if I would make them I instantly said yes of course and then almost as fast I thought you can't have mistletoe without kissy elves! 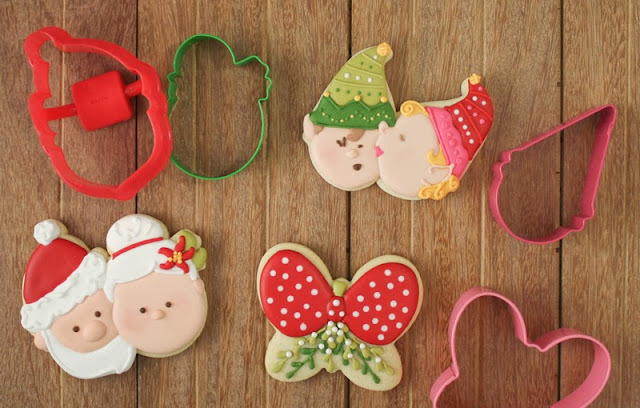 For these cookies I pieced together a Santa face cookie cutter and a little snowman for Mrs Claus and then I used an ice cream cone cookie cutter for the elves. I had thought about having the characters both face each other to kiss but I was worried that seam between the cookies would just be too fragile. Now I think they are cuter this way though because you can easily add different expressions to the elf getting kissed! To piece the cookies together first cut both shapes together to get a feel for where they overlap and then cut one of the shapes again by itself. Remove all the excess dough and attach the partial shape to the whole one on the cookie sheet for baking. The elf cookies were pieced the same way as Santa and Mrs Claus here. After the elf shapes were joined together on the baking sheet I gently curled the points of the cones to make curly elf hats. 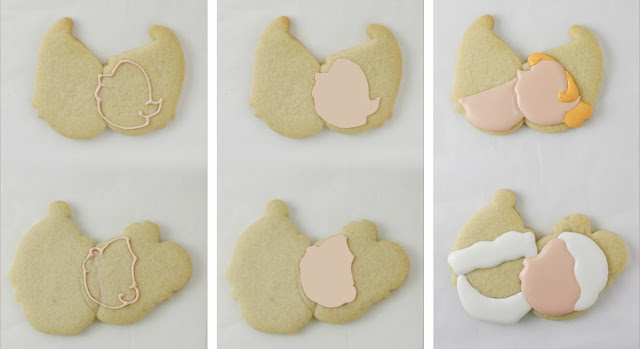 Start by outlining the turned kissing face in flesh toned icing. The trickiest element in the entire cookie is getting the turned face drawn correctly so if you need to cut a template or use a KopyKake then that is perfectly okay. I often use my iPad and the Camera Lucida app to lay in a few shapes like this just to get started. Wait a few minutes for the icing to dry and then add the shapes that sit next to the faces. Let the faces dry a bit before adding the hat bands, Mrs Claus bun and a few leaves for the flower in her hair. Continue on working in pieces until all the base shapes are done. Let the base dry for several hours before adding the final piping details. 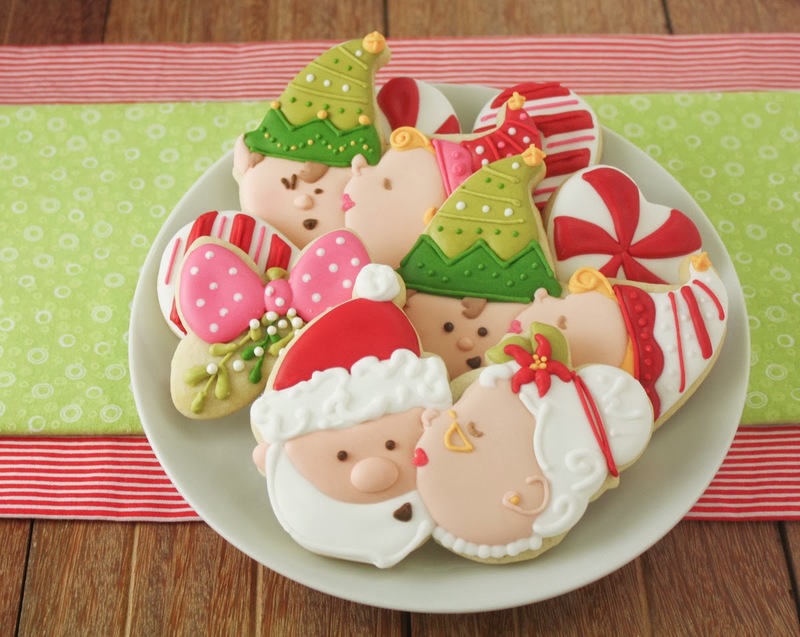 Once you break it all down cookies like this are actually fairly simple to decorate. You can work on them all at once or in little bursts throughout the day whenever you have a minute or two. Thank you for stopping by today. If you haven't read my tutorial for the mistletoe cookies at Sweet Sugarbelle's be sure to go check it out as they are a darling accent to this cookie platter. I hope you are having a Merry Christmas season so far! These are absolutely amazing! I love them!!! !